Scientists from the U.S. Geological Survey (USGS) are helping to track the movement of three strains of highly pathogenic avian influenza viruses (HPAIV) in wild birds. HPAI viruses are a concern as they are very pathogenic to poultry and some species of wild birds such as raptors. Infection can result in significant mortality of poultry and impact international trade of poultry products. In addition, while there is no evidence that the HPAI viruses found in wild birds in North America can cause disease in humans, some strains are known to be zoonotic (transmissible between humans and animals). This is the first time that a HPAIV has been demonstrated to be circulating in populations of North American wild birds. The first influenza strain was isolated in mid-December 2014 from a northern pintail (Anas acuta) in Washington State and is the same strain as the HPAIV H5N2 recently detected in poultry in adjacent British Columbia, Canada. A second virus, HPAIV H5N8, was isolated from a gyrfalcon from the same location that had fed on wild waterfowl and is essentially identical to HPAIV H5N8 strains reported earlier in 2014 in Asia and Europe. Subsequently, in late December 2014, a recombinant H5N1 virus belonging to the same group as the two HPAIVs listed above was identified from a green-winged teal (A. carolinensis) in the same state. This novel H5N1 HPAIV is different from the Asian strain of H5N1 HPAIV. Specifically, it is a virus of mixed-origin that has incorporated Asian-origin genes from the H5N8 HPAIV recently detected in a captive gyrfalcon mentioned above, together with other genes from a low-pathogenic avian influenza virus that is of North American wild-bird origin. The new identifier intercontinental group A (icA) has been proposed to differentiate this growing group of H5-reassortant viruses from the Asian H5N1 HPAIV. These viruses may also be referenced with the prefixes EA and AM to indicate the presence of viral genes of Eurasian and North American origins, respectively. In response to these initial detections of HPAIV in wild birds of the United States, the USGS is working closely with the U.S. Department of Agriculture Animal and Plant Health Inspection Service (APHIS) Wildlife Services and with State natural resource departments. These collaborations have served to enhance mortality investigations and disease surveillance to determine the geographic extent and species involvement of HPAIV in wild birds. This surveillance has led to additional detections of HPAIVs along the U.S. Pacific Flyway, including HPAIV H5N2 in a mallard (A. platyrhynchos) from Oregon. HPAIV H5N8 has been detected in an American wigeon (A. panelope) from Utah, a green-winged teal (A. crecca) and a gadwall (A. strepera) from California, and a mallard from Idaho. Knowledge obtained from this field response is critical for understanding the significance of HPAIV-associated mortality in wild birds and the ecology of these novel viruses. 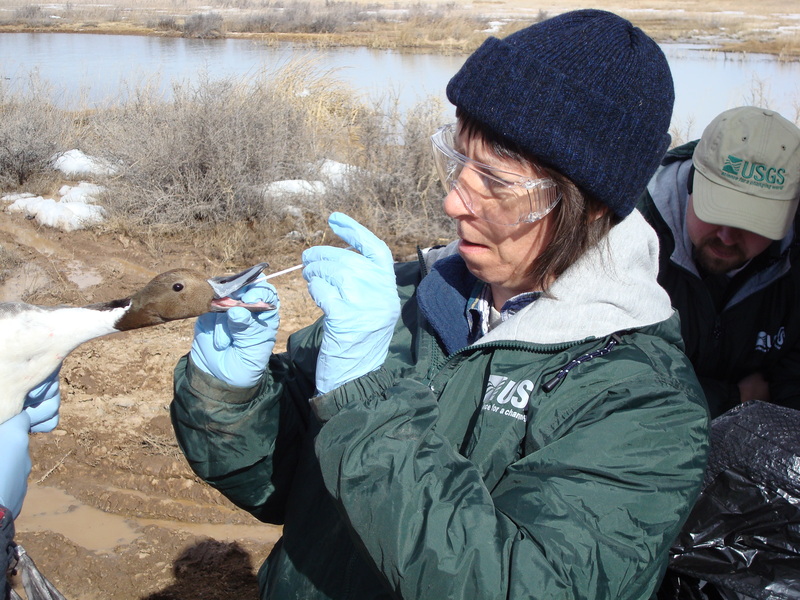 This research was funded by the Contaminant Biology and Wildlife: Terrestrial and Endangered Resources Programs of the U.S. Geological Survey.